The Children's Hour blog has produced some great book recommendations over the years. The latest series that blogger and pastor, Ray Van Neste highly recommends are the "Mr. 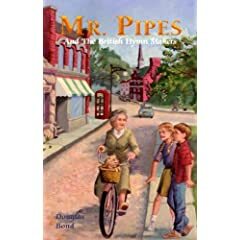 Pipes" books by Douglas Bond,(author of the Covenant and Crown books) which starts with Mr. Pipes and the British Hymnmakers. Van Neste also posts here about another Pipes book, Mr. Pipes and Psalms and Hymns of the Reformation. One other note about this blog is that he will deal honestly with the books he posts about. If he likes it, he tells his readers why. If he feels that it is not a good book, he writes graciously as he explains the problems he sees with the book. His thoughtful approach to book reviewing is very helpful in saving his readers time and money on unworthy materials.